WL-RU6 [common] - 5in1 40K/1M Cavitation Ultrasonic Tripolar Mulitipolar Bipolar Radio Frequency S. 5in1 Cavitation Tripolar Multipolar Bipolar Radio Frequency Machine. 5in1 40K/1M Cavitation Ultrasonic Tripolar Mulitipolar Bipolar Radio Frequency S. 5in1 40K/1M Cavitation Ultrasonic Tripolar Mulitipolar Bipolar Radio Frequency Slimming Machine. 5 functions combined within one machine: 1. 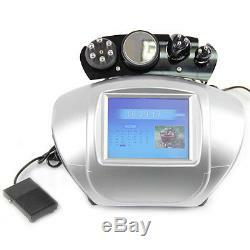 40khz ultrasonic cavitation for deep fat 2. 5Mhz tripolar RF for fat reduction 3. 5Mhz bipolar RF for face and eyes 4. 5Mhz multipolar for body 5. Led for body in 5Mhz multipolar head. Developed by Multi-Polar RF Technology which is an innovative system maximising all the benefits of RF technology. Rejuve Face: Is a new and revolutionary system of skin rejuvenation without surgery, anaesthesia and post-operative Operation. Rejuve Body: Contours, shapes and slims the body by improving cellulite and reducing circumference in as few as 3 operation sessions. It is the fastest and safest RF system on the market effective for all skin types. Offers a non-surgical, non-invasive and painless operation with no downtime for Skin Tightening & Body Contouring Operation. Cavitation frequency:40KHz Cavitation :6w/cm2(MAX) 3. Difference between Multipolar bipolar and monopolar Radio frequency. Monopolar RF heats tissue in the area rather deeply (usually up to 20 mm) and thus affects both the skin and subcutaneous fat. Bipolar RF heats tissue in the area less deeply (usually up to 2-4 mm) and thus primarily affects the skin. The patterns of energy distribution also differ. Whether simultaneous operation with both types of RF is additive, synergistic or otherwise in not entirely clear and needs further research. The manufacturers of monopolar+bipolar devices believe that such combination is synergistic and allows to reduce the required intensity of each and thus minimize side effects and possibly increase effectiveness. While Multipolar combines the electrodes for the monopolar and bipolar RF application in the same hand piece. It also utilizes sophisticated control algorithms for optimizing the concurrent application of the two types of RF as well as tailoring the output to a particular patient and operation goal. Painless operation focus RF energy at the correct position, compared to other radio frequency technology. Ru+6 uses low energy and high frequency, safe and effective 2. Aim at the skin surface and deep location, using a complex method to control the different currents and energy, direct access to the different skin layers, the effect is visible 3. Selectively targeting fatty tissue, to avoid heating other fat, to achieve the fastest operation effect 4. 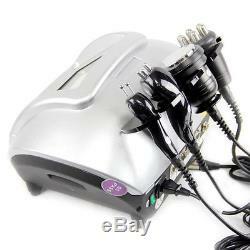 With the most useful 40KHZ ultrasonic cavitation system 5. Strengther the skin elasticity 5. Body shapeing it can promote tissue metabolism, repel the cellulite, tighten the skin, strengthen the skin elasticity and so on. Its effect will last for a long time. At the meanwhile, it can enhance the muscle elasticity and improve the cell metabolism. It creates an effect like internal Explosion. It means that the expansion and compression of wave produce a lot of tiny space inside the liquid. The gas and vapour exist in these tiny space. In the compression cycle, supersonic wave impose a positive on liquid molecule, whereas a negative will be created through the expansion cycle. There is a cohesion effect inside the liquid or biological tissues. Inside the low-density lipocyte, the cohesive effects are comparatively weak. A negative pressure, which is relative low, can create tissue gaps easily. It is called as Cavitations in physics. The explosion effects inside and outside the cells will increase the molecular movements, so as to achieve an high energy state, then lead to the lipocyte cracking. 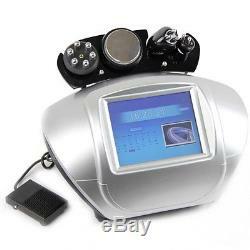 The item "5Mhz RF Bipolar Tripolar Radio Frequency Ultrasonic Cavitation Slimming Machine" is in sale since Thursday, April 16, 2015. This item is in the category "Business & Industrial\Healthcare, Lab & Dental\Other Healthcare, Lab & Dental". The seller is "uulaser" and is located in shenzhen,guangdong.